Human lovers hold hands to show affection. Masked titis wrap their tails together. You might spot a couple cozy couple sitting in a tree, hunched with all of their limbs bunched together. In the blink of an eye, the still, quite duo can become wildly alive and swinging from branch to branch. If you’ve invaded their territory you can expect a loud chewing out and an aggressive chase. Beware! The Atlantic coastal forests of Brazil are home to the Masked Titis. Bahia, Espirito Santo, Minas Gerais, Rio de Janeiro, and Sao Paulo –southeastern states of Brazil – are their main hangouts. These monkeys like to live in forests with a lot of brushy undergrowth and, of course, in banana trees. We just expect monkeys to be in banana trees, don’t we? If you think sideburns are cool, you’ll enjoy looking at the Masked Titi. Its color ranges from a soft gray to a yellowish orange, and it sports a black forehead with fashionable sideburns. Its hands and feet are also black, and its tail may have some black in it as well. The Masked Titi grows 12 to 16 inches tall and weighs 34 to 58 pounds. What’s for lunch, if you’re a Masked Titi that is? Fruits and vegetation will be the main course, with some bugs, and bird eggs for snacks. Once in a great while they’ll eat soil from an anthill or rotten tree. Care to join them? Most Masked Titis have their birthdays in August, September, or October. 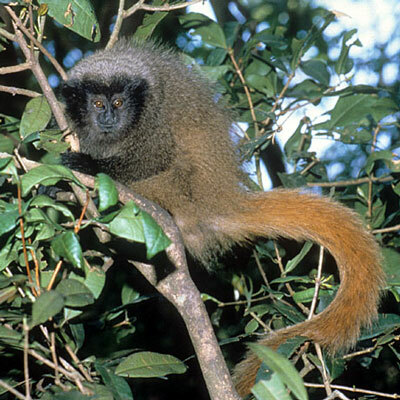 Mother Titis carry their babies inside for 5 to 6 months, and the babies are weaned between 12 and 16 weeks after birth. They very rarely have twins. After a baby is one week old, Father Titi takes care of it the most. Maybe that’s why Mother and Father Titis stay together for life. These monkeys rarely come out of the trees to the ground. They enjoy traveling through the treetops, and never fail to get plenty of rest. They are only active for about eleven and one-half hours each day. E-mail to add your Masked Titi related website.